A few years ago, I built a microscale version of Tokyo, complete with rampaging kaiju. 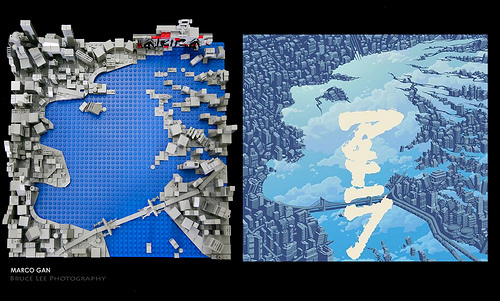 While Marco Gan‘s microscale Tokyo is considerably less colorful, it accurately captures the view of Neo-Tokyo seen in the 1988 Japanese animated movie Akira (and Katsuhiro Otomo’s original manga version that ran between 1982 and 1990). 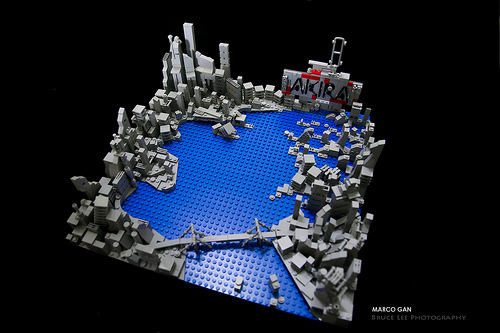 The monochrome cityscape is built on a simple blue baseplate, but includes a density of detail, from the bridge spanning the two halves of the city to a proliferation of landscape fragments. To tie his build to its inspiration, Marco also included a small backdrop with brick-built lettering spelling “AKIRA” with pops of red reminiscent of Kaneda’s bike. But it’s not until you view the diorama from a higher angle that you discover Marco has also recreated the distinctive outline of the bay from the original comic, representing a screaming human head.